The Groomers Helper is the World's #1 Safety & Positioning System for grooming pets. Used by the top grooming operations around the globe, including both PetCo & PetSmart. Literally millions of dogs have been groomed with the help of the Groomers Helper. The Groomers Helper protects both the groomer from being bitten, and the pet from being injured by controlling the pet on the grooming table. No more biters, spinners or head droppers and one person can do most nail clips! Tens of thousands of Groomers Helpers are in salons and all that use the system would not think of working without it. The Groomers Helper Safety & Positioning System allows groomers to work more efficiently, allows them to work "hands free", and helps them make more money every day. Add to that, that the Groomers Helper is guaranteed for life, and you will understand why it is such an important part of every groomers' day. Groomers Helper also manufactures the world's sturdiest table clamps, unbreakable grooming arms, and the most durable grooming loops and loop adjusters in the industry. They are all designed to help maintain the safety of both groomers and pets. Every piece of Groomers Helper pet grooming equipment was developed in our own salon, which is run by a Nationally Certified Master Groomer, and has served pet owners in our region for over 30 years. This hands on experience is why our equipment truly solves the major grooming gear challenges that groomer face on a daily basis. 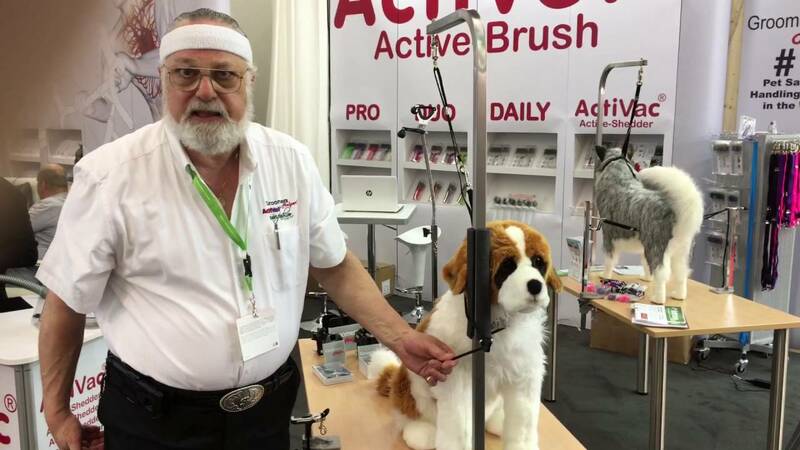 In addition, Groomers Helper is proud to represent ActiVet as their exclusive distributor in North, Central & South America and select countries around the world. These are the original flexible head, stainless steel grooming brushes that reduce brushing time by up to 50% and significantly relieve stress and fatigue on groomers hands and forearms. With different stainless steel pin designs on the different brush faces for different jobs, the ActiVet flexible head brush system breaks mats, finishes and undercoats, and is just simply the finest the industry has to offer. ActiVet brushes are manufactured with the highest quality stainless steel, have milled pin ends to avoid scratching, have removable backing pads to allow for cleaning and replacement of bent pins, have ergonomically designed handles and are color coded for easy selection for the job at hand. They are unmatched in quality, perform flawlessly, and help make groomers more money with less stress each time they use one. ClotIt® all-natural blood clotting powder is the most recent addition to the Groomers Helper Family of Products, and has already won professional acclaim, awards in major industry publications, and support by the largest pet grooming operation in the world (1650 stores/5000+ groomers). An all natural blend of minerals, ClotIt® is not a chemical styptic, so it does not harshly sting the pet when applied. ClotIt® does not stain fingers or expensive grooming tables or pads, does not stain fur, does not clump or cake-up, and has an unlimited shelf life. ClotIt® can be used on both minor bleeding like nail quicks and severe wounds as well. ClotIt® works with the pets natural blood clotting system both quickly and painlessly. The clean, white, hemostatic powder is effective on dogs, cats, birds, reptiles, and farm animals. Decades of having to use harsh, stinging chemicals and astringents to stop bleeding in pets is over! ClotIt® is truly a new generation product that is long overdue. Professional groomers and stylists look to Groomers Helper for salon safety, grooming arms, table clamps, grooming loops, grooming tables, grooming brushes, ActiVet Flexible Brushes, kennel leads, loop adjusters, Groomers Helper Essentials, ClotIt non styptic all natural blood stopping powder, dog, cat and pet grooming tools, dryer holders, ActiVacs, brush racks, stainless steel brushes, slickers, finishing brushes, de-matting brushes, undercoating brushes & home grooming products.